Jerry Chesnut wrote a number of songs recorded by Elvis, including "T-R-O-U-B-L-E" and "Love Coming Down." 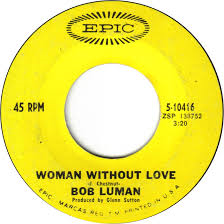 Although Bob Luman had the original recording of "Woman Without Love," the first released version was by Johnny Darrell, whose version came out just three days before Luman's. Bob Luman was born in April 1937 in Nacogdoches, Texas. His early interest was in Country music and rocabilly. He appeared on the Lousisiana Hayride in 1956. Chart success evaded him, however, and he was thinking about quitting the music business to become a prefessional baseball player when, in 1959, he recorded "Let's Think About Living," which became a big hit and changed his mind. Luman died of pneumomia at just 41 years of age in 1978.